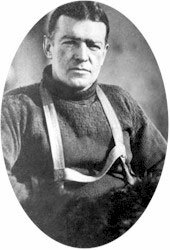 Shackleton was born in Kilkee, County Clare, Ireland in 1874, and served as a merchant marine officer. He went to school at Dulwich College from 1887 to 1890. In 1904 he married Emily Dorman. They had three children - Raymond, Cecily and Edward (Eddie), born in 1911. Their marriage was marred by numerous affairs on Ernest's part, most notably his relationship with the American born actress Rosalind Chetwynd (Rosa Lynd) which was begun in 1910 and continued on and off until his death in 1922. Shackleton participated in the National Antarctic Expedition, which was organized by the Royal Geographical Society in 1901, and led by Robert Falcon Scott. This expedition is also called the "Discovery Expedition", as its ship was called Discovery. The expedition was the first to penetrate the Ross Sea and reach the Ross Ice Shelf. He may have placed what has become one of the world's most famous advertisements in the Times of London in December 1901: "Men wanted for hazardous journey. Small wages. Bitter cold. Long months of complete darkness. Constant danger. Safe return doubtful. Honour and recognition in case of success." (Some historians have claimed that this ad was placed, although they do not all agree on when or which newspaper, but no one has yet been able to locate the original newspaper clipping; see [here] for a full discussion). Shackleton with Scott and Dr Edward Wilson trekked south towards the South Pole in 1902. The journey proceeded under difficult conditions, partially the result of their own inexperience with the Antarctic environment, poor choices and preparation and the pervading assumption that all obstacles could be overcome with personal fortitude. They used dogs, but failed to understand how to handle them. As with most of the early British expeditions, food was foolishly in short supply; the personnel on long treks were usually underfed by any sensible measure and were essentially starving. Scott, Wilson and Shackleton made their "furthest south" of 82°17'S on December 31, 1902. They were 463 nautical miles (857 km) from the Pole. Shackleton developed scurvy on the return trip and Dr. Wilson suffered from snow blindness at intervals. When Morning relieved the expedition in early 1903, Scott had Shackleton returned to England, though he had nearly fully recovered. There is some suggestion that Scott disliked Shackleton's popularity in the expedition and used his health as an excuse to remove him; he was Merchant Marine and Scott was Royal Navy—which was also part of the contention with whether Albert Armitage was to remain for the second winter. In part, Scott exhibited unusual stamina and may not have recognized differing abilities of others. Shackleton organized and led the "British Antarctic Expedition" (1907–1909) to Antarctica. The primary and stated goal was to reach the South Pole. The expedition is also called the Nimrod Expedition after its ship, and the "Farthest South" expedition. Shackleton's base camp was built on Ross Island at Cape Royds, approximately 20 miles (40 km) north of the Scott's Hut of the 1901–1904 expedition; the hut built at this camp in 1908 is on the list of the World Monuments Watch's 100_most_endangered_sites . Because of poor success with dogs during Scott's 1901–1904 expedition, Shackleton used Manchurian ponies for transport, which did not prove successful. Accomplishments of the expedition included the first ascent of Mount Erebus, the active volcano of Ross Island; the location of the Magnetic South Pole by Douglas Mawson, Edgeworth David and MacKay (January 16, 1909); and locating the Beardmore Glacier passage. Shackleton, with Wild, Marshall, and Adams, reached 88°23'S: a point only 180 km (97 nautical miles) from the South Pole. While the expedition did not make it to the pole, nonetheless, Shackleton, Adams, Marshall, and Wild were the first humans to not only cross the Trans-Antarctic mountain range, but also the first humans to set foot on the South Polar Plateau. The Imperial Trans-Antarctic Expedition set out from London on August 1, 1914 with the goal of crossing the Antarctic from a location near Vahsel Bay on the south side of the Weddell Sea, reach the South Pole and then continue to Ross Island on the opposite side of the continent. 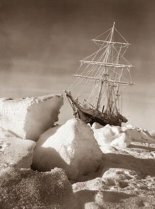 The expedition's goal had to be abandoned when the ship, Endurance, was beset by sea ice short of its goal of Vahsel Bay. It was later crushed by the pack ice. The ship's crew and the expedition personnel endured an epic journey by sledge across the Weddell Sea pack and then boat to Elephant Island. Upon arrival at Elephant Island off the Antarctic Peninsula, they rebuilt one of their small boats and Shackleton with five others set sail for South Georgia to seek help. This remarkable journey in the 6.7-meter boat James Caird through the Drake Passage to South Georgia in the late Antarctic Fall (April and May) is perhaps without rival. They landed on the southern coast of South Georgia and then crossed the spine of the island in an equally remarkable 36-hour journey. The 22 men who remained on Elephant Island were rescued by the Chilean ship Yelcho after three other failed attempts on August 30, 1916 (22 months after departing from South Georgia). Everyone from Endurance survived. In 1921, Shackleton set out on another Antarctic expedition, but died of a heart attack on board his ship, the Quest, while anchored off South Georgia Island on January 5, 1922. His body was being returned to England when his widow requested that the burial take place on Grytviken, South Georgia Island instead. Shackleton was buried there on March 5. In 1994, the James Caird Society was set up to preserve the memory of Shackleton's achievements. 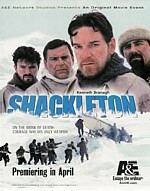 Its first Life President was Shackleton's younger son, Edward Shackleton. The British Antarctic Survey's logistics vessel RRS Ernest Shackleton (the replacement for RRS Bransfield) is named in his honour.